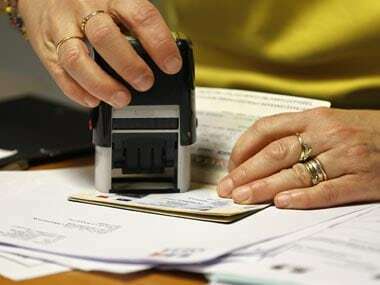 Washington: The US Citizenship and Immigration Services (USCIS) said it has reached Congressionally-mandated 65,000 H-1B visa cap for the fiscal year 2020, after it started receiving the applications for the most sought-after work visa among foreign, including Indian, professionals. The USCIS, the federal agency mandated with task of approving such applications, on Friday said "it has received a sufficient number of petitions projected as needed to reach the congressionally-mandated 65,000 H-1B visa regular cap for fiscal year 2020." The fiscal year begins on 1 October 2019 and it the USCIS started receiving the visa petitions from 1 April. However, the agency did not reveal the number of petitions received by it in the first five days. The USCIS said it will next determine if it has received a sufficient number of petitions to meet the 20,000 H-1B visa US advanced degree exemption, known as the master's cap. The agency said it will reject and return visa fees for all unselected cap-subject petitions that are not prohibited multiple filings. It will continue to accept and process petitions that are otherwise exempt from the cap. Petitions filed for current H-1B workers who have been counted previously against the cap, and who still retain their cap number, are exempt from the FY 2020 H-1B, the USCIS said. It did not say if it would resort to a computerised draw of lots as was the case in the last several years. This year the USCIS has suspended the electronic registration requirement for the fiscal year 2020 cap season to complete user testing and ensure the system and process are fully functional. Under the new system, the USCIS first selects H-1B petitions submitted on behalf of all beneficiaries, including those that may be eligible for the advanced degree exemption. The USCIS says that the change will result in an estimated increase of up to 16 percent (or 5,340 workers) in the number of selected petitions for H-1B beneficiaries with a master's degree or higher from a US institution of higher education. "These simple and smart changes are a positive benefit for employers, the foreign workers they seek to employ, and the agency's adjudicators, helping the H-1B visa program work better," USCIS Director L. Francis Cissna had said in a statement.